Air feeds offer a number of features and benefits to stampers, and cost is relatively low considering all that these devices deliver. Given their compact size, air feeds can mount on bolster plates or directly on dies, resuting in quicker changeover, reduced setup time and no required alignment of feed to die. roll feeds represent a large portion of press feeds in use today. Interestingly, their use has recently branched out to applications such as automation, assembly and specialty machinery. Air-operated reciprocating feeds, or air feeds, feature actuation via mechanical, electric solenoid or pneumatic valve. In all cases, the feed should be controlled by the press. An air feed may grip the edge of material or clamp the full width to move it. Programmable servo-motor-driven roll feeds, or servo feeds, also offer a number of variations, such as feed-roll release for pilot pins or for camber correction. Roll release may be mechanical or pneumatic, controlled by a solenoid valve which in turn is controlled by the press. Feed-roll squeeze may be controlled by spring pressure or air pressure. The servo-feed control may be taken over completely by the press controls—for the highest level of safety, the servo feed als should be controlled by the press. A servo feed also may be paired with another machine, such as a cutter for cut-to-length operations. Air feeds offer a number of features and benefits to stampers, and cost is relatively low considering all that these devices deliver. Air-feed accuracy and repeatability excel due to the feed slide block moving between two positive stops. The three most important points in setting up and running air-feed equipment: alignment, alignment and alignment. Air feeds offer great flexibility because they allow feeding of unusual shapes in unusual positions. 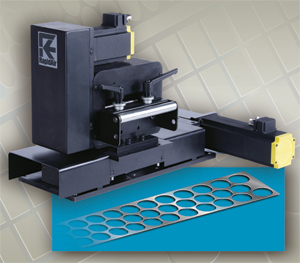 With its small envelope, the air feed allows mounting on the bolster plate or die itself—an old technique made practical by the low cost of an air feed—to push or pull material through the die. Benefits of die-mounted feeds include quick changeover, reduced setup time and no required alignment of feed to die. However, air feeds do have disadvantages. Progression- or feed-length changes can be time-consuming, requiring hand tools and trial and error. Servo feeds, alternatively, only require users to enter a new length or job number. And an air feed requires a constant volume of high-quality air. Excess oil, dirt and water in the air will shorten feed life and inhibit function, and fluctuating air volume will cause erratic feeding. Though simple, air-feed repair requires complete disassembly and installation of new O-rings and seals. A feed manufacturer or distributor can perform the overhaul quickly, and repairs should be backed by a warranty. Air feeds generally run best with flat material, so keep an eye on excessive coil set, which may hamper feed motion. If you have a unique application, discuss it with your distributor or the manufacturer. Air feeds may be equipped with accessories and options including anti-buckling guides for limp, delicate materials such as very thin flat or wire stock feeding at high speeds or long progressions. When producing tight-tolerance parts, air feeds can be provided with clamps to release the stock for pilot-pin positioning, bringing increased accuracy. 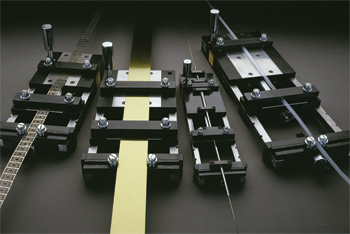 Clamps may be grooved or profiled to feed round or unusual shapes, or padded to protect the material or finish. Also, a multi-stroke control may be employed for long progressions. When shopping for an air feed, consider if the application is right for an air feed—are material thickness and width suitable? And note that the speed range of an air feed may top out at 300 strokes/min. Make sure that the feed manufacturer can provide complementary equipment—reels, straighteners, loop controls, etc.—on a timely basis and can respond rapidly to support requests. And a good supplier should be able to easily modify standard equipment to meet your unique needs. One major benefit of a servo feed is its high production rate—perhaps twice that of an air feed—that translates into rapid return on investment. A servo feed can store many jobs and provides simple job setup. Given some basic information related to strokes/min., feed angle, feed length and pilots, the feed will calculate best acceleration/deceleration and speed. You may override the feed advisor and set these elements, then store them with the job number. The ability to recall a stored job with all of its parameters significantly cuts changeover time, making servo feeds ideal for short runs or frequent job changes. 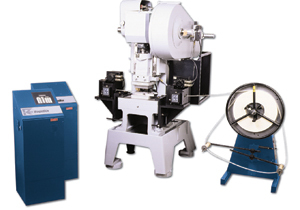 Servo stagger-feed models are designed to aid setup by selecting the best pattern for round or nonround parts. This technique allows the use of irregular-width material with minimum waste, and by pre-programming the optimum pattern, coil-material waste is reduced. bring additional flexibility, too. The servo-feed display may be able to switch between English and metric units, and options allow toggling between languages, say English and Spanish. Best practice for servo-feed care points to cleanliness. Keep the rolls and interior clean, and protect the controls from dirt and lubricant. The servo feed is a problem solver in its basic state. Explore its many options for other production solutions, such as special feed-roll coatings or finishes that may be available. Urethane-coated rolls will protect painted, polished or soft material, while a roll provided with a matte or knurled finish offers improved grip. Servo-feed rolls also may be relieved or profiled to handle unusual material shapes with such profiling possibly serving to guide material. One major benefit of a servo feed is its high production rate—perhaps twice that of an air feed—that translates into rapid return on investment. Also, a servo feed can store many jobs and provides simple job setup. with outputs for punch control, and gag programs can be customized. A tandem servo feed, with an entrance and exit servo used to grip and move the material in harmony, offers another solution for feeding thin or flexible material. Electronic gearing between the two feeds maintains light tension on the material. Tandem feeds may be used with coil stock, strip stock, piloted dies and gag dies. Today’s compact servo feeds boast state-of-the-art controls that offer features of larger, more expensive units. All of these servo-feed features may result in simpler, less expensive dies that may be fed diagonally, side to side or in any pattern. When shopping for a servo feed, match the feed to the job or potential application. Consider the preponderance of jobs, stock thickness, stock width and speed in your operation. Review the operating manual—available online from most manufacturers—for your possible equipment selection, looking for ease of operation and maintenance. Find out if the supplier has the capability to offer a full line of products and support growth with payoff reels, straighteners and other support equipment that can be easily integrated with your feed and press operation. Also check that the supplier stocks items to make mounting and feed operation more effective: mounting brackets and tables, pilot release, press-control interface, etc. What about product manufacturing assurances, such as CE certification? And could your stamping operation personnel benefit from other language or metric displays? Does the servo feed control allow you to toggle between these settings? Strip alignment is important when using a servo feed. From die to payoff reel, start square—perhaps something as simple as using a carpenter square to check the strip. The feed may be mounted to the die, bolster plate, adjustable bracket or stand, and mounting should be rigid and straight into the die. The feed should not push material uphill nor downhill, and electric power should be free of noise and correctly grounded. Again, the servo feed should be kept clean, particularly the feed rolls and control cabinet. Also protect cables running from the servo motor to the control cabinet. Keep them out of the path of fork lifts and foot traffic. A tandem servo feed, with an entrance and exit servo used to grip and move the material in harmony, is ideal for feeding thin or flexible material. Electronic gearing between the two feeds maintains light tension on the material. Tandem feeds may be used with coil stock, strip stock, piloted dies and gag dies. matters, more in terms of deflection than grip. Feed rolls should be large enough in diameter so that they will not bow or deflect. A 2.75-in.-dia. roll will not have significantly more material grip than a 1.75-in.-dia. roll. For ideal material control, upper and lower feed rolls should be driven and be of the same diameter. A small upper roll coupled with a larger lower roll is difficult to synchronize. Information for this article supplied by Rapid-Air Corp., Rockford IL. Tel. 815/397-2578; www.rapidair.com.